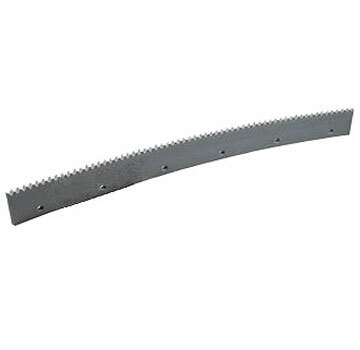 PRODUCT: 24 x 1/4 INCH SERRATED EDGE, GRAY EPDM RUBBER REPLACEMENT SQUEEGEE BLADE. PRICE/EACH (1). SQUEEGEE, 24 INCH WIDE, 1/4 INCH SERRATED (V-notched) GRAY EPDM RUBBER, STRAIGHT SQUEEGEE, SET IN STEEL FRAME. BLADE CAN BE REPLACED IN FRAME. RECOMMENDED FOR USE WITH DECK COATINGS. PRICE/EACH.